Rusiško biliardo lazda Tulip Santos, 700 gr. Rusiško biliardo lazda Tulip Santos, 700 gramų svorio. Характеристики: длина 160 – 161 (см), вес 690 – 740 (гр), диаметр наклейки 12,5 – 13 (мм), баланс 42 - 47 (см), диаметр турняка 26,5 - 29 (мм). A kind of washed down: "Tulip". 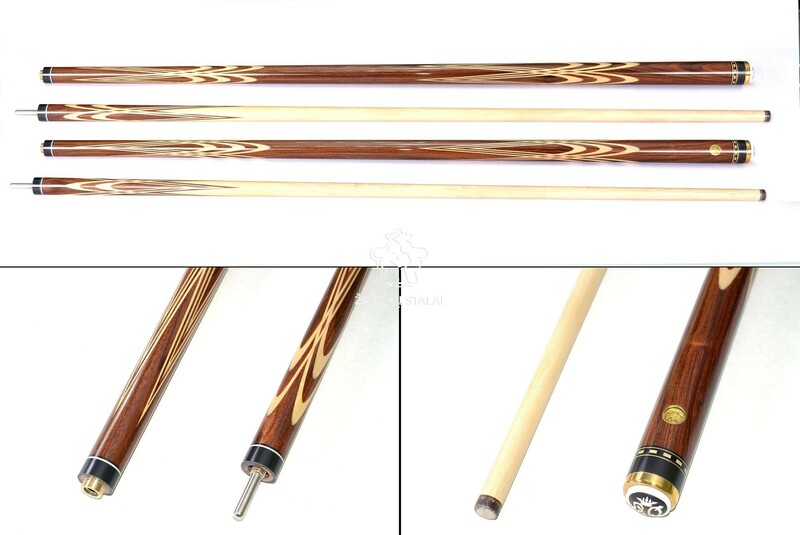 This cue has an aesthetic, noble appearance washed down, shaped like a tulip flower. It is a modification of the classic cut made on the four sides of the cue, which as a result combines two types of cuts - in the upper part of the cue crown, in the lower part of the Viennese washed down. The kiy thus works in all planes. Such work is considered the top of the skill. Making tails with a thickness of 0.8mm requires jewelry precision. Such cues are good in all respects: they have a good spring, density, do not walk and the blow is as clear as possible. Polysander: The color is diverse, because there are about 300 species of this breed! But the most common color is pinkish with brown tint or dark chocolate. Density varies from 850-1000 kg / m3. It is difficult to work because of its high density and gravity, but can be polished. Due to its color and texture, as well as exclusivity, Rosewood is used mainly in multi-shot cues. Wood is considered exclusive and expensive, as the tree grows very slowly and to get mature wood it takes at least two centuries and at least three years of aging before production! Homeland: Africa, Southeast Asia, America. -Hornbeam. Color from white to light beige. The density is 750 kgm³. Even before the invention of light metals, hornbeam was used in aircraft construction. The hornbeam, as the only wood resistant to vibration, was made by propellers. Grab - strong and whimsical in the processing of wood. Traditionally used in the manufacture of shutters for Russian billiards. Evgeni Onishchenko uses only the Carpathian hornbeam for his cues, since this species of hornbeam surpasses all the others in all its characteristics. Homeland: Russia, Ukraine. Product specifications: length 160 - 161 (cm), weight 690 - 740 (gr), the diameter of the sticker 12.5 - 13 (mm), the balance 42 - 47 (cm), the diameter of the fin 26,5 - 29 (mm). Rusiško biliardo lazda Classic 35 Gash Eben Licewood, 710 gr. Rusiško biliardo lazda Classic Black Horn Amorillo 6x4, 715 gr. Rusiško biliardo lazda Classic Palmira 6x4, 715 gr. Rusiško biliardo lazda Classic Rosewood 4 Hardwood 21 Gashes, 705 gr. Rusiško biliardo lazda Classic 35 Gash Bocote Black Horn, 720 gr. Rusiško biliardo lazda Classic Palmira Black Horn 6x4, 725 gr.